No research proves that alcohol consumption directly causes stomach ulcers, according to the University of Maryland Medical Center. However, if you drink excessive amounts of beer or other alcoholic beverages, you are at an increased risk of developing stomach ulcers. Heavy drinking causes cirrhosis of the liver, a condition clearly tied to a higher frequency of gastrointestinal ulcers. Drinking any alcohol, including beer, can irritate stomach ulcers and cause pain. Your stomach generates gastric acids strong enough to dissolve the wall of your own stomach. A coating of thick mucus normally separates the digestive processes from your stomach tissues. Peptic ulcers form when that lining fails. Unusual stress was once thought to be the main cause of stomach ulcers, but physical reactions of the stomach to stressful situations only cause sudden ulcer pain. The Helicobacter pylori bacterium causes most ulcers by weakening the stomach's mucus. Other contributing factors include nonsteroidal anti-inflammatory drugs such as aspirin, smoking tobacco and drinking beer or other alcoholic beverages. Alcohol consumption increases the severity of the stomach injury. Alcohol irritates stomach ulcers by direct contact with the open sore and by generating more hydrochloric acid and pepsin, the two primary stomach acids. Any food or beverage that triggers unusual stomach acid production increases the odds of more damage. The mild tranquilizing effect of the hops in beer could briefly relax your stomach, but hops does not prevent acid production. The acid produced by drinking large amounts of beer can irritate even a normal stomach lining to the point of nausea. If you drink too much beer with an ulcerated stomach, you could vomit uncontrollably and experience intense burning stomach pain. If you develop stomach ulcers and have a drinking problem, the increasing damage from the ulcers alone could threaten your life. As stomach acids erode deeper tissue layers, blood vessels exposed to the digestive fluids rupture, sometimes resulting in severe bleeding. If the wall of the stomach develops a hole, food and digestive fluids can leak into your abdomen cavity. Bacteria in the debris released through perforated ulcers can cause peritonitis, a potentially fatal infection. Other gastrointestinal problems related to heavy drinking include nutritional deficiencies and pancreatic disease. Stomach ulcers, aggravated by alcohol, sometimes precede the development of stomach cancers. 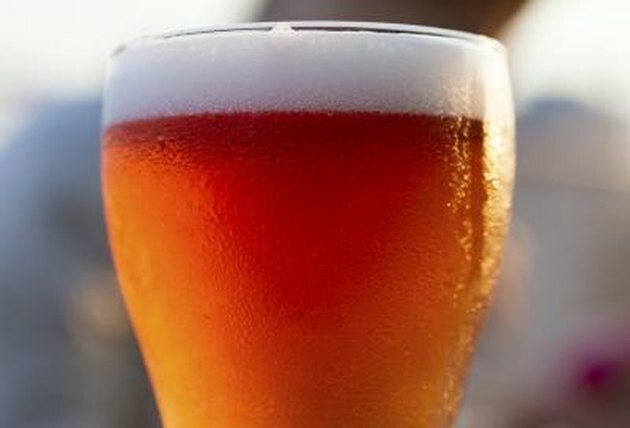 Beer will not kill H. pylori, the usual cause of peptic ulcers. To treat the infection, your physician could prescribe a combination of antibiotics and an acid inhibitor. To aid the healing process, you'll need to avoid anything that triggers unusual acid release, especially on an empty stomach. Avoiding coffee, soda and tomato juice, as well as beer, lessens some ulcer symptoms. Bland diets do not prevent ulcers or cure them, but avoiding spicy food could decrease stomach pain. Ask your doctor if you're well enough to enjoy an occasional beer, but don't continue to drink any beverage that triggers ulcer pain. Can Milk Help an Ulcer?